Tea Party supporters attend a rally Monday evening in Elko, Nevada, for the start of the Tea Party Express national tour. Washington (CNN) -- The old proverb "The enemy of my enemy is my friend" is one way to describe the 2010 election -- especially when explaining the complicated alliance between Tea Party activists and the Republican establishment. These two former enemies -- remember the contentious and divisive primary season -- are now united in the common goal of trying to defeat Democrats on November 2. Look ahead to the next day, and there is a good chance the alliance will begin to show cracks should Tea Party candidates score big wins -- especially those running for Senate. As many as eight Tea Party candidates could be coming to Washington in January: Sharron Angle of Nevada, Ken Buck of Colorado, Ron Johnson of Wisconsin, Mike Lee of Utah, Joe Miller of Alaska, Rand Paul of Kentucky, Pat Toomey of Pennsylvania and Marco Rubio of Florida. All of these candidates, with the exception of Johnson, defied the wishes of the GOP establishment and beat Washington-backed candidates in the primary or, in the case of Lee and Miller, defeated incumbent Republican senators. These eight newly minted senators would likely line up behind Sen. Jim DeMint, the South Carolina Republican who opposed his GOP colleagues and helped long-shot conservatives win their primary contests. These new lawmakers would immediately become an influential voting bloc with other GOP senators aligning themselves with this group. Republican leaders would have to juggle the demands of a more conservative GOP conference while facing the reality that to pass legislation in the Senate, compromise is a necessity. Republican National Committee Chairman Michael Steele sought on Saturday to downplay any perceived rift between the Tea Party and party leaders during a rally in California. And Sarah Palin predicted Monday that GOP leaders would embrace the Tea Party's ideals or face its wrath. "I think the machine within the GOP is going to understand realize that this 'We the People' message is rising and is resonating throughout with independents, with hard-core conservatives, with moderates, because it's so full of common sense and time-tested truths that could put the economy back on the right track," Palin told CNN's Shannon Travis at the kickoff of the Tea Party Express bus tour in Reno, Nevada. "Heaven forbid the GOP machine strays from this message. If so, the GOP is through." Palin did downplay the idea that the Tea Party is a divisive movement that excludes moderate-minded individuals from the Republican Party. "As long as we apply time-tested truths and we prove that they work -- and that's what we have to do in the next two years: Send a new Congress to D.C. to apply those solutions that are based just on free-market principles that really can't be argued then by the independents and by the moderates," she said. "Then they start embracing more of what the party's all about." It remains to be seen what the final results will be in the midterm election. What is known, though, is that Washington will be a much different place on November 3 than it was 24 hours earlier. 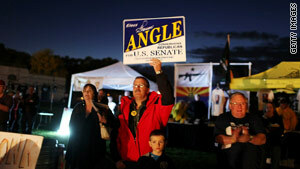 • Tea Party Express spends its second day in Nevada with stops in Ely and Las Vegas. • Vice President Biden headlines an event in Vancouver, Washington, for Sen. Patty Murray before skipping down to San Francisco to campaign for Sen. Barbara Boxer. • Former President Bill Clinton headlines a rally for Democratic Senate nominee Kendrick Meek in St. Petersburg, Florida. • Debates: Florida Senate; Illinois Senate; South Carolina governor.